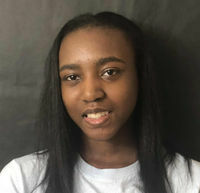 Nakia Harmon is a freshman at McIntosh High School and is new to the McIntosh Trail. She is the second oldest out of five siblings. She enjoys listening to the opinions and ideas of others. In the seventh grade, she was a participant of her school´s Modern Woodmen oratorical contest. She began sewing at the age of nine. Some of the things that she enjoys doing in her spare time are spending time with family, reading historical fiction novels, and watching action movies. She enjoys writing since it's her only escape from her four siblings.